Welcome to the Best Buy media network. Reaching highly engaged audiences in the shopping channels of the world's largest electronics retailer. Best Buy customers are affluent, motivated, and tech savvy. And they visit Best Buy more than a billion times every year in a growing number of channels. And that means you can engage with these customers too right at their point of purchase. We offer several ways to reach those customers in a variety of multichannel media placements. Through high definition, high impact video in our 1,000 plus stores, and through relevant and targeted display advertising on bestbuy.com and mobile channels. And you can reach qualified Best Buy customer segments off Best Buy properties too as they continue to browse. 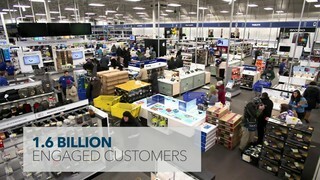 Best Buy uses the power of video to communicate with customers in all our channels. Keeping them up to date on the newest products and providing them with tips for shopping every product category. Customers want and watch videos from Best Buy that showcase products and new technology. That creates an opportunity for us to use our turnkey creative services to feature your products in branded video stories. And seamlessly integrate them into our most popular regular programming. The world's largest consumer electronics retailer is also one of the most effective media platforms in the world with multichannel reach, a savvy affluent audience, and integration opportunities only a step away from the point of purchase. Welcome to the Best Buy media network.